Your stepdaughter has arrived and been installed in the tower chamber, per your instructions. This has already led to the predicted difficulties, as my dinosaurian bulk cannot fit within the narrow tower. When she refused to descend for supper this evening, I was reduced to flying outside her window and poking my face in. I found her combing her long hair, which raises my second concern: while I am ill-acquainted with human customs, your instructions to periodically observe her appear to overstep the bounds of propriety. However, as you are not only her stepmother but a human noblelady yourself, I shall bow to your procedural knowledge. While narrative is not my strength, as you have requested to hear the particulars of your stepdaughter’s arrival, I shall attempt to recount them. I at once corrected her that (a) I am not a dragon but a dinosaur, for “dragon” is a word used in unreliable peasants’ tales while “dinosaur” is a rigorous term used by modern scientists (and I know no more precise term of matching rigor that would correctly describe me); and (b) I do not eat humans. Although she appeared accepting in my presence, she was apparently unaware of my excellent dinosaurian hearing, for I later overheard her sobbing in her tower chamber. Since forcibly removing her would be a greater disruption to the experiment than tolerating her presence, I did continue. However, I fear my measurement of the gases emitted is imprecise, since my attention was repeatedly distracted by your stepdaughter’s fidgeting. I shall have to obtain further phosphates — and while that will not be hard, I fear what would result if she repeats this during next month’s planned analysis of platinum, a rare and expensive metal from distant lands. Fortunately, further interference was forestalled by the arrival of one of the local delivery-boys. I was (or, more precisely, my servants were) pleased to obtain further preserved vegetables and fresh milk; the boy also brought the soil samples I had requested from his farm. (A vascular stem plant of highly unusual height had grown there the previous autumn; I was unfortunately unable to study it before it was cut down and burnt.) It is fortunate there is no snow in this locale as there is farther north; that would greatly impede this sampling. Your stepdaughter, to my great satisfaction, remained in the courtyard for the rest of the morning. As you have demanded an immediate response, I write in haste. Your stepdaughter indeed remained in the company of Jack, the delivery-boy, for between one and two hours before (the gatekeeper reports) he expressed a need to return to his farm. Being personally unaware of his reputation in our environs, I asked the castle cooks. They were at first unwilling to tell me, but finally reported that his name is Jack, his father died approximately two years ago, and he currently keeps farm with his mother (named Mildred). While his reputation has been besmirched with accusations of laziness and poor financial dealings, he has recently come into money and has hired hands to perform delayed maintenance on the farm. Further, he has always been acknowledged for his courage. I regret that I cannot add to this testimony personally. Most of the neighboring farmers are frightened to speak with a dinosaur such as myself, no matter how often I reassure them I am not a dragon. Perhaps it would help if I introduced myself by a more precise taxonomic term than “dinosaur”? Sadly, I cannot tell which genus of dinosaur I would best be categorized under. None of the published descriptions of specific dinosaur genera fit me well, the Academy has not answered my letters asking for clarification, and I hesitate to create a new term by myself. In the meantime, the local farmers and villagers remain unacquainted with the delights of Science, and I am forced to interview my reluctant servants about Jack’s reputation. Regardless, I reassure you I have indeed been periodically inspecting your stepdaughter’s room, as instructed. The customs of human nobility are difficult to understand, but as your castellan, I will comply and (I hope) eventually comprehend. I indeed agree that (even from my limited knowledge) Master Jack seems an ill match for your stepdaughter. However, might it not be an overreaction to forbid her from seeing any young men? Does not understanding come from experiment? Still, as I know some experiments bear overly high risks, I will comply. Master Jack will next be coming on the ninth, as per his normal schedule. Taken aback, I protested the local stream was much too small — but I could demonstrate another invention of Captain Savery’s: an engine powered by steam. She immediately agreed, and the visibly-curious servants helped us assemble the needed vessels and tubes. I lit the fire with my dinosaurian breath, and we watched the engine spurt water across the courtyard. It was a simple demonstration, but they seemed surprisingly engrossed. Just after I had increased the fire (again at your stepdaughter’s urging) and the engine started squirting water over the castle wall, Master Jack arrived bearing food. Your stepdaughter eagerly told him all about the engine, but after a few minutes (bearing in mind both your instructions, and her inaccuracies in attempting to explain the principles behind it) I drew him away into a longer discussion of gas dynamics. He attempted to follow, but was sadly ignorant of that science’s mathematical foundations. I showed him out after approximately a half-hour. Meanwhile, I overheard my servants wondering to each other whether I planned to set fire to the village to build more steam engines. I reminded them that I am no dragon but a dinosaur, and your castellan. They did not seem to be reassured, but I know not what else to say to them. I must protest your interdict. I am not a dragon; just as I will not burn down villages, I will not hold maidens hostage for no rational reason or custom. I am a dinosaur, and a scientist. You have entrusted me with this castle, and you have charged me to keep watch on Rapunzel, so I will follow your instructions regarding her even though they be confusing and distasteful. Yet I will explain Science to whomever I wish: to Jack, if he wishes, or anyone else. To my surprise, two days after my demonstration, Rapunzel asked me to teach her Science. I attempted to start her on gas dynamics, but as it did not hold her interest (nor had she the necessary math), we swiftly moved to mechanics. It appears that human fingers are much more versatile than dinosaurian claws; we have been able to measure the velocity of marbles after collisions with much greater precision than I could beforehand. I hope this may distract Rapunzel from her ill-advised romance and convince the villagers that there is more to Science than lighting fires. Jack again arrived bearing foodstuffs, as normal. I met him at the gate, where (despite the suspicious glances I saw from some of the servants and passers-by), we passed a pleasant hour discussing physics before again being stymied by his sad lack of math. To my surprise, though, he suggested that next week I begin remedying that lack — a suggestion which I gladly accepted. However, after I left, I am informed that Rapunzel passed some words with him inside the gatehouse (where she had been hiding) before the gatekeeper’s arrival caused her to fall silent. Before our normal physics lesson later that day, I asked Rapunzel what they had said. She refused to respond; I thought it futile to press her. Per your orders, I have cautioned the gatekeeper against a repeat. As instructed, Jack did not come to the castle today. Instead, I visited him at his farm. After reassuring his mother that I was not a dragon but a dinosaur (sadly, she did not appear to be reassured), we went out into the fields for a somewhat-satisfactory math lesson. He did not even mention Rapunzel, and the neighboring farmers who were eyeing us with unease looked relieved at my departure. Meanwhile, Rapunzel herself continues to repeat physics experiments with me, but she refuses to analyze any results unless I work through them with her. I continue to fly outside her window as instructed, and to the best of my knowledge, she has not seen Jack since last week. I am not a dragon, but a dinosaur. Dinosaurs do not eat humans. Nor has Jack done anything deserving eating; he is a surprisingly apt student who has (despite your suspicions) engaged in no importune behavior. I have indeed received your letters, and I am disturbed by how you continue to emphasize one subject and even descend to threats. While this castle does belong to you, I remain and shall remain an honorable dinosaur and scientist. I was under the impression we both understood this when I became your castellan? I regret to report that, while doing my inspection last night, Rapunzel leaned out her window to lambast my “horrid suspicions” and “leering glare” which was “always watching” her. I apologized, saying that I was only following your orders; she replied that she would not study Science with me anymore and retreated glumly to her bed. Thinking back, I am unaware what might have prompted such behavior, as nothing has changed from the last week. I suppose you will be satisfied to hear that I did discover a rope ladder in her room; I burnt it despite loud objections. No, my silence does not mean I am conspiring with Rapunzel against you. Rather, there is nothing to report. Rapunzel has holed herself up in her room save for meals. She has apparently attempted gardening — I found the remains of strange vines under her window and have taken samples for future study. Meanwhile, Master Jack has (despite your insinuations) not been in the castle, nor spoken with Rapunzel. I flew to meet him at his farm yesterday, where he continues to study Science diligently, belying his reputed laziness. I might mention that I saw one of your Message-Men delivering Jack’s mother a letter as I was approaching the farm. Since they were eyeing Jack and me with fear later on, I venture the opinion that your letter did not have its desired result? You will, no doubt, be reassured that Master Jack’s mother has forbidden his return to this castle. I was surprised when I saw Mistress Mildred bringing today’s delivery instead of her son. She instantly fell to the ground when I approached her, eventually stammering (after much encouragement from me) that she “thought he really shouldn’t dare” come here anymore. To my further inquiries, she added that I “should know really well why.” As I did not wish to terrify her further, I let her go. I fear someone is planning something, but I do not know what — and I do not know what experiments would show me the answer. To my shame, I confess my investigations were insufficient. This very evening, I discovered Jack in Rapunzel’s room, his having accessed it via another rope ladder. He and Rapunzel were talking, apparently about some ball or feast. I interrupted their conversation by sticking my head in the window. They both immediately fell to the floor screaming and begging me not to burn them alive. I replied that I would neither burn my own castle nor kill humans needlessly, and demanded to know how long they had been seeing each other. Rapunzel babbled that this was the first time, but Jack immediately said he had been coming every few days since late January. I thanked him for his honesty but ordered him to leave at once, which he did. I see now that not only have my investigations been insufficient (for I missed Jack’s presence), but so has my understanding of their characters. I have planted myself atop Rapunzel’s tower for the present, where I shall meditate on this. I also await whatever advice you may have to give. I do not know how or whether this letter will reach you, unless I fly it on my own dinosaurian wings. Perhaps, should the besiegers triumph, one of them will send it with a letter asking for you to send a better and more human castellan. And, if they are correct in their claims, perhaps you will be glad to see their letter. I find that hard to believe — did you not pledge your friendship to me? Did you not welcome me as the hoped-upon herald of future dinosaurs joining society and Science? Have I not been your good castellan these years? It is that which holds me back inside these walls: that a good castellan would not use his claws and fiery breath upon his people, nor a good scientist upon his neighbors. Thus, I wait in anxious hope that you will rescue me. Yet the mob of farmers and villagers outside shout from outside every wall that you support them; that you have sent them letters asking them to rise against me as if I were a vicious dragon (I use the vulgar term by intent); that I am luring Jack to devour him; that my very silence proves my guilt and shame. I know Mistress Mildred did receive some letter from you, but surely she is misrepresenting it? I have not sent out the few human guards, for they would be outnumbered; it seems every villager has come out in arms. I could fly out myself, but would that not prove their claims that I am no civilized scientist and unfit to join society? But if I continue to do nothing, would not the castle you have entrusted me be lost? Your stepdaughter, I fear, does not share my doubts. She shrugs off the siege, saying that one captor will be no worse than another. And human politics are beyond me; might it be she is correct? But when I asked her to teach me of politics, she ordered me out, saying she needed to wash her hair. As I reflect on the strange letters you have recently sent me, I wonder how much of the customs of human society I have failed to understand? I cannot but wonder how many letters will pile up unsent before this castle is overrun. Meantimes, I underestimated Rapunzel’s ingenuity and both her and Jack’s dedication. While looking out toward her tower this rainy evening, a lightning flash illuminated it enough for me to see (with my dinosaurian eyes) a human shape climbing up from the siege lines! Seeing the futility of further conversation, and not noticing any activity from the siege lines, I flew down to deposit Jack in the infirmary and write this letter. I am again at a loss as to what to do. Even my shipment of platinum for experiments is now unable to reach me. Perhaps it would have been better had you entrusted this castle to a human in the first place? As Jack has singlehandedly lifted the siege, I now give him my wholehearted recommendation as a fitting match for your stepdaughter. Rapunzel met me before dawn this morning outside the infirmary, pleading for me to be kind to Jack. Still disturbed, I said I could not make any promises and reminded her that he had rebelled against his liege lady (you) and her castellan (myself). In response, she claimed you had indeed urged them to rebel, and made many other claims about you that I scarce would have credited two months ago. However, your recent letters’ single-minded focus on keeping Rapunzel securely enclosed and watched makes her claims sadly plausible: that none of your instructions concerning her are ordinary, that you are accustomed to lose trust in anyone who is not cooperating with your watch of her, and that you would stir up any matter of rumors to keep young men away from Rapunzel. I scarce would credit such claims normally — but have not these last months given as good evidence toward them as any experiment? Shaken, I promised to keep an open mind about Jack, and we entered. I must confess I was shaken by this and asked him what to do. Jack proposed an experiment: I would let him go, and if he ended the siege, then I would set Rapunzel free. That plan, Rapunzel added, would let me discharge my duty to you by keeping your castle intact. Reluctantly, I saw that both other courses would have me acting like a dragon in one way or another. At a loss for what else to do, I expressed doubts that he could end the siege, but agreed. I followed him and Rapunzel up to the battlements, where he waved his hands and announced to the now-silent crowds outside that I did not wish to act as a dragon, and that I would willingly let both him and Rapunzel go and promise never to hurt anyone without cause. The assailants replied, asking what proof I offered of this, and accusing me of planning to burn them all for my new steam engine. Thereupon he turned to me, and I had nothing else to do but nod my head. The crowd murmured in confusion, but they were evidently calmed, and some were throwing down their improvised weapons. Jack then ordered the gates thrown open, and (with me observing) he and Rapunzel strode out to the crowd. As I write this less than an hour later, I am still wondering if I did wrong. My trust in you is lessened — but did not experiment point in that direction? I did violate your instructions — but what else could I have done save act like a dragon and prove my enemies right? I did lose control of the situation — but is that not part of joining society? I am pleased that we are finally once more in correspondence. Your letter clarified everything wonderfully. No, I shall not throw Rapunzel in the dungeons, nor shall I devour Jack, nor shall I do any of the other evil things you were insinuating I might do in the letters you wrote Mistress Mildred and the other townspeople (which letters they recently showed me.) Their earlier behavior was improper, but they do not deserve any grave punishment: Rapunzel, I now see, was reacting to her unjust imprisonment; and Jack is unaware of nobles’ etiquette and unfortunately prejudiced against dinosaurs. 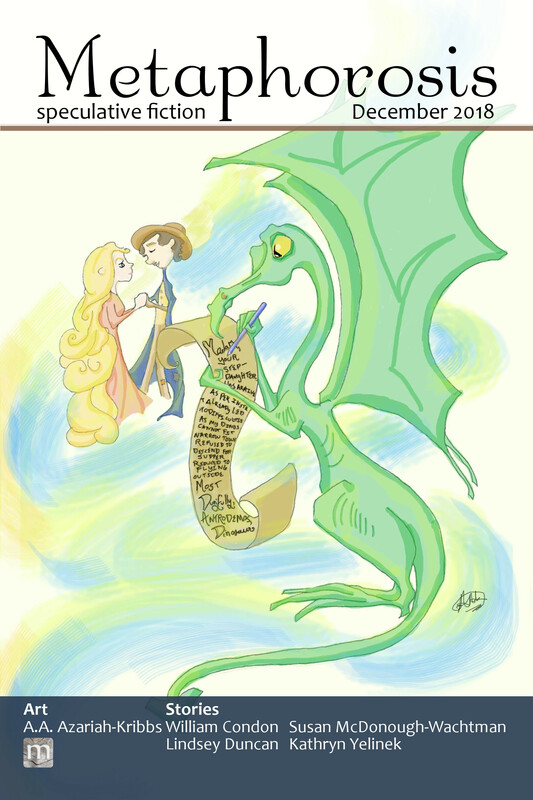 Therefore, I will not re-imprison Jack or Rapunzel. They are currently at Jack’s house having luncheon with his mother, and they are already talking of betrothal. While I personally think this is far too hasty, I will no longer attempt to discourage them. Further, Jack is showing no laziness in his scientific studies: he is already talking of double-checking the farm’s boundaries using trigonometry and studying methods to improve the soil’s health before the next planting. He has also given me new inspiration in my experiments — I have recently sent orders to sell the platinum and buy materials to study better farming. The recent siege showed I can no longer merely observe society; if I am to act, I shall act as a good scientist who uses Science for a purpose. Perhaps farming is not the best career for Jack in the long run? If so, marrying a noblelady such as Rapunzel would not be unfitting.